Her God-given mild and groovy singing voice, lyrics that remind you of the good old days that modern society has been slowly losing touch with, a blend of Afro-European sounds reminiscent of that of Zap Mama and Asa are some of the many things that make kuwada truly unique. 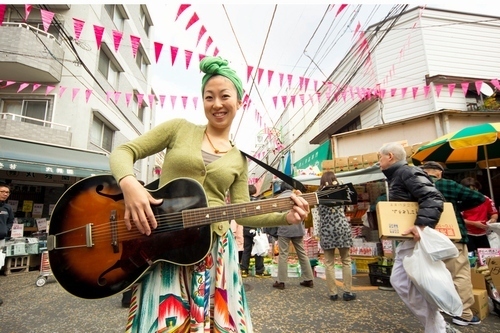 Her experience doing HIP HOP back choruses in her hometown, Hiroshima, during her teenage years, drew her to R&B. Began mastering singing, lyric writing, composing, guitar, harmonica, and DTM through self-study. Furthermore, she has seen success also as illustrator and object artist. In recent years, has made her own costumes and illustrations for music videos and CD covers.